Lowdown: A day in Anatolian life viewed through the mirror of a murder investigation. One of the many achievements of that wonderful movie called The Water Diviner was it putting me on a quest to experience what Turkish cinema has to offer. If I need to pinpoint, it was mostly the performance of Yılmaz Erdoğan that gripped me. So I went and had a look, and it looked like Once Upon a Time in Anatolia offered me to have the cake and eat it too: an accomplished Turkish film that stars, amongst others, my dear friend Erdoğan. 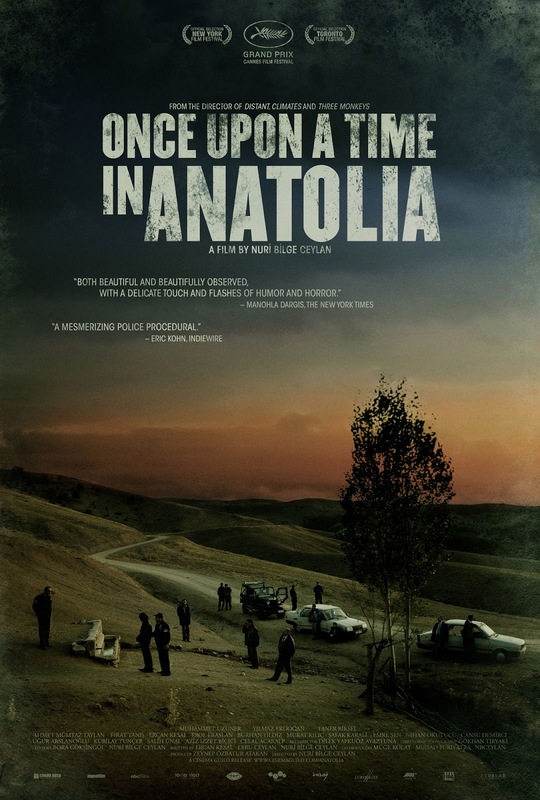 I will tell you this, though: Once Upon A Time in Anatolia did not give me an easy time. The first half or so of this slow two and a half hour affair takes place over night. A police convoy is driving a couple of murder suspects around rural areas during the night in search of the body they hid. They are escorted by the local prosecutor and a doctor. Between events – or the frustrating lack of events and the way this gets to the characters – we see into their inner souls and the world they reside in. We see a world stuck in the past, a world more busy with the dead than with the living. A rather tragic world. Dare I say, our world as seen from the prism of Anatolia. Three main characters stick out for us to focus on, and each carries his own personal tragedy about. The doctor (Muhammet Uzuner) coming in from the big city, with his learned self, is deeply affected by his recent divorce. The police chief (Erdoğan) focuses on his work because life at home with his autistic son is much harder than gruesome murder investigations. And the prosecutor (Taner Birsel), he goes about telling fatalistic tales about a woman that decided to die at a certain date and miraculously achieved just that. Following the night we return back to the town, a picture perfect derelict small town, to witness the day after that night. The trends continue; there is no start or finish to Once Upon a Time in Anatolia, it’s just a glimpse into a foreign world. I guess this therefore qualifies the film as rather eccentric, and it certainly is; I suspect many will find it boring. But if you’re willing to give the less ordinary a chance you will be rewarded with an experience that the run of the mill flicks can never deliver. This is art, and good art at that. Today’s news shows us photos of a Turkish policeman standing near the drowned body of a Syrian refugee boy. It’s a picture that tears your heart apart. And image wise, it felt like it came directly out of Once Upon a Time in Anatolia. Overall: Not the easiest movie to watch, but well worth the effort. 3.5 out of 5 Turkish coffee sipping crabs.